Where Did the Stanford Cardinal Go? Is it just me or did the Stanford Cardinal disappear? Since they “disappointed” at the Battle for Atlantis they’ve ho-hummed to victories over [insert major west coast market here] Universities (that’s a Denver and Seattle reference). There’s a huge gap in their schedule – off from 12/2 to 12/15 – contributing to their fall from headlines but also perhaps adding to the idea that they could be mediocre. Let’s talk about why they’re not mediocre for a second. They settle in at 40th in KenPom’s rankings with their tight 20th rated defense and have a few individuals putting up some gaudy numbers in Dwight Powell, Chasson Randle, and Josh Huestis. The report on this team was they needed those pieces to do precisely that. So why, amongst the returning drone of the Pac-12’s mediocrity, is Stanford being dismissed? Arguably it’s a result of that very perception of mass mediocrity across these Pacific-12 schools; sort of an all-for-one quality to that thought. When you start a season 6-3, regardless of opposition, you expose yourself to that very discussion. And when you lose at home to Belmont, you manifest that very claim, and fall beneath the radar. NEW QUESTION: Is Stanford right where they want to be? They’d prefer to have beat Mizzou and Minnesota in a gauntlet of a Battle for Atlantis but we can certainly check off the “Battle Tested” box on their tournament resume (though I hate the close-loss-to-a-good-opponent argument). They would also have preferred to play those games with Aaron Bright. He’s the guy who can make this team tick. The Cardinal are 2-2 in his absence and during last season’s NIT run, Bright was the team’s leading scorer and second assist-man. I’ve likened him to the quintessential playmaker of Cardinal past (Lee, Hernandez, Knight) and that’s a big part of Stanford dropping close games to talented opponents. Of course I can’t say whether or not Chasson Randle indeed fouls Minnesota’s Andre Hollins with 0:00.4 remaining in a tie ball game if Bright’s playing. That was just an unfortunate play. So the good news is they get Aaron Bright back. He returned on 12/2 against Denver U; just trying to get a feel again, playing 15 minutes to the tune of 3 points and 3 turnovers. Frankly, to date, Bright hasn’t played well. He’s putting up career highs in TO% and DR% and lows in ORtg and eFG%. Bright could play brighter and I believe this is a good sign for the Cardinal. Success while an integral piece struggles is a key indicator for improved production. 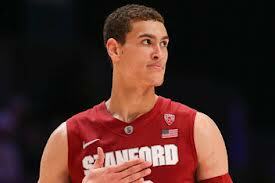 Conversely, Dwight Powell has played great. But it’s not being talked about. Powell ranks in the top-15 in the conference in PPG, RPG, FG%, eFG%, FTrate, and DR%. He’s making things happen. Prior to season’s tip, much was made of this team’s pieces and who needed to step up. They’ve unfortunately lost Anthony Brown for the season but Powell is filling his role and they’ve found a dynamic stopper in Brown’s stead. Josh Huestis is playing the role of bad man for the Cardinal, swatting shots and gobbling rebounds. As a group, this team seems to excel at such. And it ultimately should come as no surprise that a Johnny Dawkins team can defend. Scoring will and has been an issue for his teams and that’s perhaps where Bright’s absence and struggles have been most heavily felt. But back to the new question. Have I really outlined a dreary Cardinal report here? Is this a team that should go unmentioned when we discuss whether or not the Pac-12 can compete for more than two bids? Do the Cardinal like their spot? My impression is that Stanford will gladly fly where curious eyes won’t gander; where they can tighten their D and hone their O and take an unsuspecting Pac-12 by storm come January.